In Japanese, plastic food is typically found outside many restaurants to show what’s on the menu. Called “shokuhin sanpuru” (食品サンプル), the plastic food is made from different resins and colored to look real. The plastic matcha latte in the above photo was made from silicone and vinyl chloride, which began melting in a Nagoya cafe display case due to intense summer heat. This made the national news in Japan. And even appeared on television as an indication of just how hot this summer is. 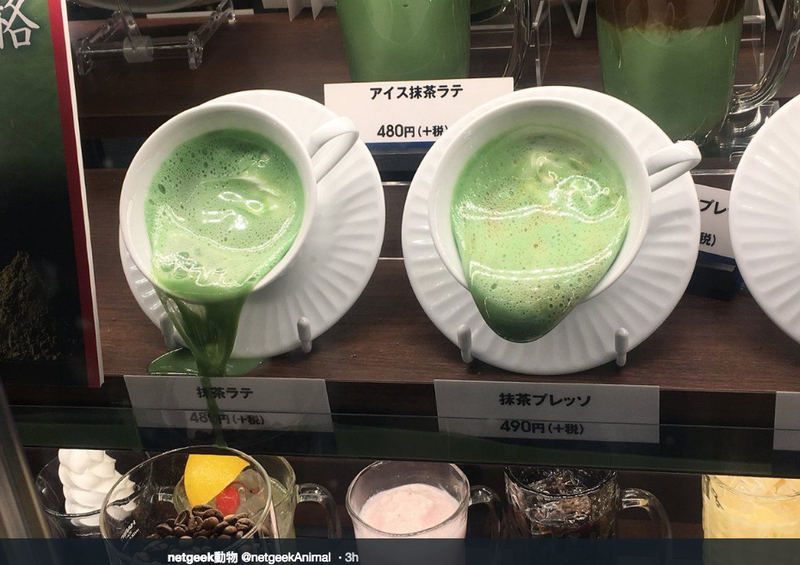 According to NHK and NetGeek, the temperature inside the plastic food’s display case reached around 60 degrees Celsius (140 degrees Fahrenheit), and the matcha latte samples melted during a two-day stretch in which it was nearly 40 degrees Celsius (104 degrees Fahrenheit) in Nagoya. While the other plastic food appears to have held up, things weren’t helped by the fact that the cafe is located in a glass-roofed shopping area. Looks like the cafe figured out a quick fix. This Store Sells Food. Plastic Food.